Looking through my archives, I was surprised that I hadn’t reviewed this gin sooner. After all, Ingenium Gin has cropped up in so many different posts already. I tested Cocchi and Lillet with Ingenium; I brought it to the 50 States of Gin tasting, and yet I never gave it a proper write up. So apologies for the delay. If you’re a reader of my blog and you’ve been wondering about this rather new gin. Curious? Good, let’s take a closer look at Maine’s latest gin. 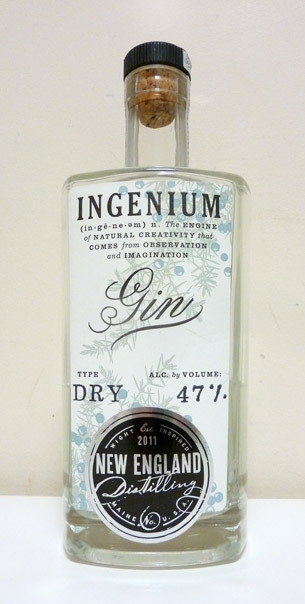 From New England Distilling in Portland, Maine, we review Ingenium Gin . It smells rich and earthy, on the nose. At the tasting, one reviewer called it a bit of a “coriander bomb.” The earthy, spicy character is the first thing that you experience. On the nose, its a bit of alcoholic burn. The taste of Ingenium Gin is true to the nose. Again, a good deal of spicy rich coriander and a bit of subtle juniper in here too. I’ts very quiet playing a complimentary role. It also has a taste close to Genever. Rich and warm notes of grain come through. The base does have a lot to do with the earthy parts of the botanical mixture that are highlighted. The grain mix reminds me a bit of a whiskey malt base. I would guess that there’s something like Red Wheat or Rye going on in here, but I don’t know for certain. The New England Distilling website mentions little other than it uses a Pot distilling method to preserve the grain flavor. Also, they’re working on a Rye. So I don’t think I’m too far off. Another note of interest, is that in the finish, there’s some sweet herbal notes. I think i detect a hint of lemongrass in here. Hints of pepper, perhaps even white pepper. That being said, its an interesting, if particularly divisive spirit. I’ve found in mixing that it presents itself clearly and loudly and tends towards overpowering other ingredients. But as I’ll note, this is not always a bad thing. As long as you match up your flavors properly. As with many gins which echo the strong notes of a flavorful grain base, we see certain patterns emerge. Gin and Tonics can be hit of miss. With Q tonic, the fresh grain notes shine and are cut with a hint of quinine. In a more sweet tonic, it’s a little bit jarring. Makes a great Negroni, and how well it works with a Martini likely will depend on how much you like the earthy notes of Ingenium Gin. I think that the vermouth nicely works in harmony with the Ingenium Gin, creating a veritable array that reminds you of inhaling the air of a freshly opened spice cabinet. Where I thought Ingenium worked less successfully was in the “floral” category” of gin cocktails. By this I mean the Aviations and Moonlight Cocktails. Where I thought Ingenium was rather surprisingly successful was in cocktails with strong herbal components. For example, A Southside cocktail with a hefty dose of mint mixes wonderfully with Ingenium. Deep and earthy, retaining much of the flavor from the grain, Ingenium gin is likely to split gin drinkers right down the middle. Recommended if you like strong emphasis on earthy and grain like notes, probably not your cup of tea if you like neutral bases with a heavy focus on bright juniper or floral Contemporary style gins.